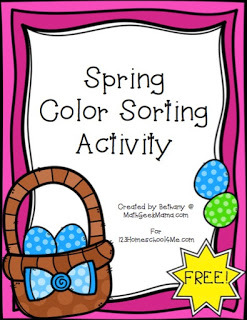 Help kid practice identifying 6 colors with this fun, free printable color sorting activity using spring baskets. 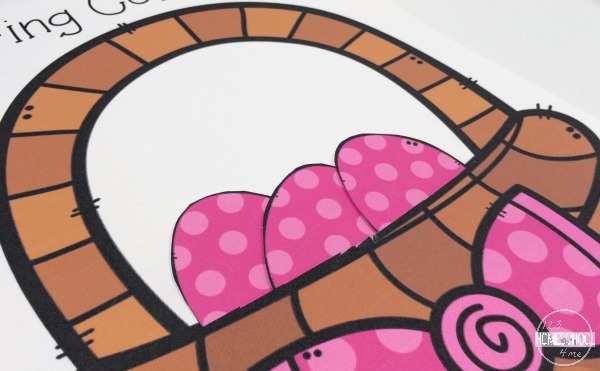 This is a fun toddler, preschool, and kindergarten activity. Spring is such a wonderful time to learn and explore with little ones. They are naturally curious, and on the lookout for patterns to observe. If you’re looking for a fun, simple Spring activity for toddlers and preschoolers, try this! This simple color sort printable set will help your little ones practice sorting, matching, color words and fine motor skills. To get started, you will need to print all the eggs and baskets. I suggest using card stock for durability, and then laminating them. This will allow the pieces to hold up over time (and many small hands!). Laminating the baskets will also allow you to write on them if you’d like. 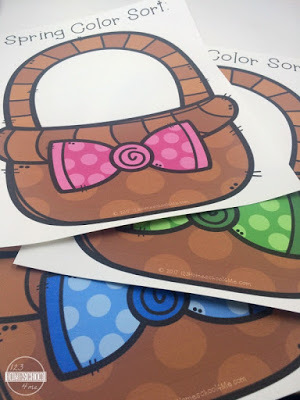 So if you’re working with older preschoolers on color words, you could write the color on each basket to help them learn the words as they match the colors. Once everything is printed, cut out the eggs. This is the only time consuming prep work, but once it’s complete, you can use it again year after year. 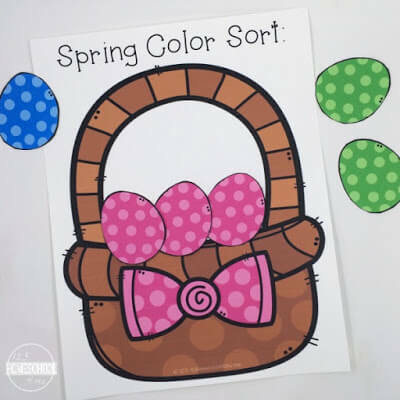 Mix up all the eggs, and lay out the colored baskets, and let kids sort the eggs into the matching basket (according to the bow color). You could even cut a slit in the top of the basket if you’d like, allowing kids to put the eggs “into” the basket. If you do this, you may want to glue it to another piece of card stock after you cut the slit, making it easier for kids to stick the eggs into the basket. After your kids have sorted and learned the different colors, here are some other ideas for how to use this color sort activity. First, you could set up an “egg hunt.” Mix up the eggs and pick a random basket and have your child find only the blue eggs, or only the green eggs, etc. Or hide the eggs around the room and let them find the eggs, then sort them according to their color. Finally, after correctly matching all the eggs, have your child find other objects that match the colored baskets. This could include small toys, marbles, beads, pens, anything they can find that matches the colors on the baskets. 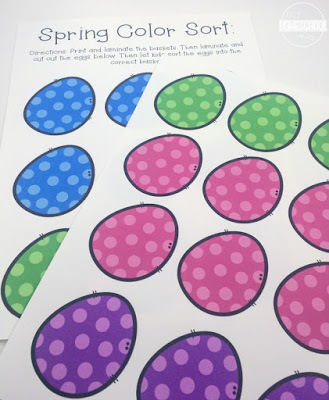 If they enjoy this simple color sort and egg hunt activity, you may also have fun going on a simple shape scavenger hunt! This is a great excuse to get outside and learn. Have fun learning and exploring through play!